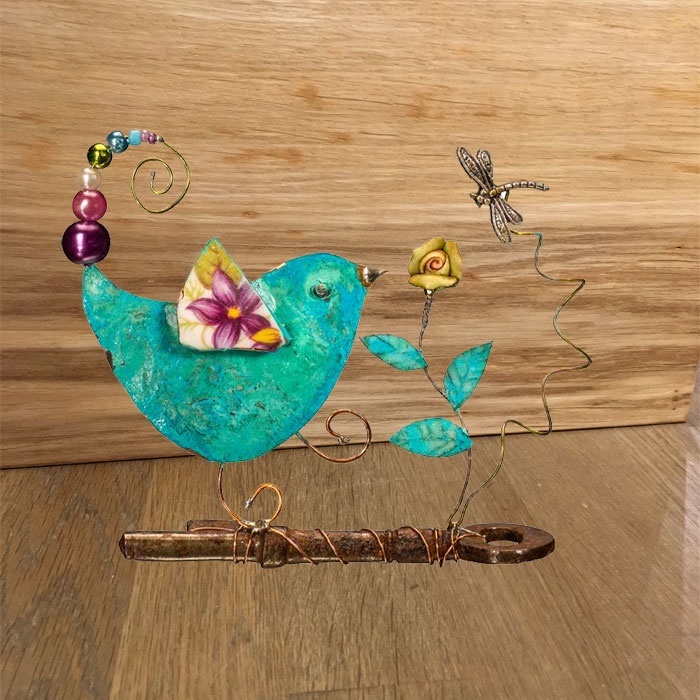 A beastie assemblage depicting an adorable little birdie assemblage made from embossed copper sheet with a pretty china wing, a twirled brass beaded tail and a soldered tin beak. He is finished in crystalline verdigris and prances on an original vintage iron key with handmade porcelain flowers and a little insect. Size: 95mm tall. Presented in a gift box with a signed booklet from the artist. Handmade by Linda Lovatt in her wee studio and gallery in the Scottish Borders town of Jedburgh, Beastie Assemblage products are made from copper and brass sheet, broken bits of pottery, beads, buttons and anything pretty and are then aged with chemicals to give the beautiful verdigris colour. Due to the handcrafted nature of beastie assemblage products, pieces may vary slightly to those shown in photographs.